Puppet Terrors began as an underground toy company, both figuratively and literally. Initially all the products were made totally by hand in a murky, New York basement. Upon the release of the initial character lineups of Bunky The Clown, Death Row Joe, Klaus and Hack, Puppet Terrors were embraced by both fans and press. Their first year's reign of terror landed the puppets in the pages of Bizarre, Rue Morgue, Amazing Figure Modeler, Stuff and Toyfare. With their growing popularity and exposure creator Jesse Wroblewski decided to bring the puppets to a wider audience. After months of researching manufacturing firms, a company was found who could mass produce the puppets with the same attention to detail and quality which brought the collectables their initial praise. 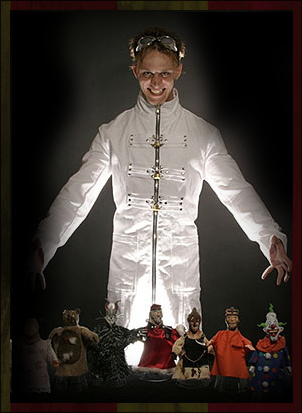 In October 2003 Puppet Terrors launched their line of collectable puppets onto the world followed by a comic book series based on the puppets with problems entitled "Murder, Mayhem... No Strings Attached." Over a decade later, the tiny terrors still seem to garner attention and screams wherever they pop up.